If a pokies game (the Aussie slang term for slot machines) is advertised as a 1024 ways game that means that there are 1024 possible winning combinations you could hit. Many online five-reel slots games only have 25 pay lines, so with 1024, there’s significantly more ways of winning. Read on to find out more about 1024 Ways pokies and where to play for real money online. With usual pay lines, symbols must be placed in a particular sequence on the reels to form a winning pay line. In 1024 ways pokies games, it doesn’t matter where on the reels the symbols are. Symbols don’t need to be in 25 particular patterns – instead they just have to be present on all five reels and they are allowed to form a winning pay line in any way. 1024 ways are a popular type of slots, and there’s no shortage of them online. In both 243 ways pokies and 1024 ways pokies, you pay a flat rate per spin instead of paying for a selected number of pay lines. However, you still can adjust how much you wish to bet per spin. You also need the same symbol on every reel to hit a win. In 243 ways, there are three symbols on five reels, so there are 243 ways this can happen (hence the name). In 1024 ways games, there are four symbols on each of the five reels, so you have even more chance of getting one of the same symbol on each of the reels. 1024 ways pokies are arguably more fun because you have even more chances to form winning combos, but 243 ways pokies games are more common and readily available. It’s easy to see why 1024 ways pokies are so popular. There are so many winning combos you could possibly hit and even though you can’t adjust the cost by choosing more or fewer pay lines, you can still alter how much you’re paying per spin so 1024 ways slots aren’t necessarily expensive to play. Pokies that have 1024 ways of winning are modern slots games, so they always have plenty of extra features, free spins, multipliers and exciting bonus games as well. In general, they’re more thrilling and interactive, so if you want a modern pokies game with good odds, we suggest giving a 1024 ways pokies game a spin. If you want to play 1024 ways with real money you need to make sure you’re playing at a reputable and trustworthy site. We have tried and tested all of the virtual casinos recommended in our casino table and can vouch for their services. All of these Web casinos have high quality pokies games, including 1024 ways slots as well as hundreds of other casino games. They also protect your security by utilising a minimum of 128-bit secure socket layer digital encryption technology to safeguard all player transactions, allowing you to play safely with an assured peace of mind that your personal and financial information is safe. While the number of 1024 Ways pokies available isn’t very large, there are a handful of fun games to try on the Internet. A couple of our favourite 1024 ways pokies games are Arctic Fortune slots and Secret Santa slots, which we’ve provided an overview of so you get an idea of what to expect from these types of games. Like all 1024 ways pokies, Arctic Fortune has five reels with four symbols on each. 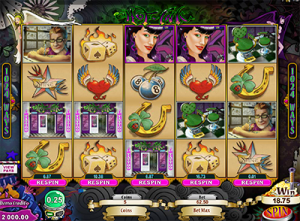 In this game the map symbol works as the scatter symbol, if you have two scatter symbols on your reels you are paid double the betting amount for your spin. If you get 3 – 5 scatter symbols on your reels you win 3 – 40 free spins with a 6x multiplier on any winnings you make during your free spin round. The Arctic Fortune symbol is the wild symbol and will be replaced for any other symbol to help you form a winning combination, however it will not turn be replaced for a scatter symbol. You can adjust your coin value from $0.01 – $0.20 and the number of coins from 1 – 10. There is the option to max bet which will maximise the cost of each spin but also increase the amount you win when you hit a winning combination. 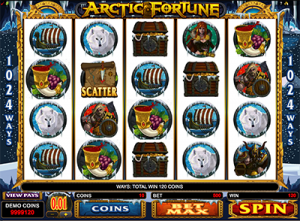 Artic Fortune is a fun snow and Viking themed 1024 ways slots. 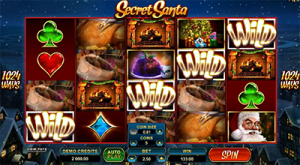 Secret Santa is a white Christmas themed 1024 ways pokies game. Whenever you get a winning combo, that is five of the same symbol on each of the five reels, the ‘5 Of A Kind Again!’ bonus feature will be unlocked. The ‘5 Of A Kind Again!’ feature first pays you out for your original win, then the five winning symbols will be replaced randomly for other symbols to give you the chance to get a second winning combo from the same spin. The Secret Santa symbol is the wild symbol and will substitute for other symbols to help you score a win. The Christmas cracker symbol is the scatter symbol and any scatter wins multiply the total bet staked. The Secret Santa Bonus of the game is that one of seven mystery features can be randomly triggered at any time. Each of these seven mystery features can be very rewarding for example you can win five free spins where any winnings you make during these free spins are multiplied by three, or the Rolling Reels feature where every consecutive win will increase the multiplier. You can play these games and many other 1024 Ways pokies at Slots Million, which houses over 1600+ pokies game available for free play or real money bets. Use the search function to search specifically for the number of paylines you with to play.